L’Oréal Paris India is running a 'Say Yes To Colour' campaign, which I support. You know I like me my hair colors. They kindly offered me a pack of Casting Crème Gloss to try out, but since I'm here in England & you know it's such a hassle to ship liquid products, I asked them if they'd be interested in sending it to one of my wonderful readers in India, instead. They said YES! About L’Oréal Paris Casting Crème Gloss Hair Color : It is a semi-permanent hair color that has NO AMMONIA. Lasts for up to 28 shampoos. If you want to WIN one for yourself, please read the rules & comment below this post. You have to be a subscriber/follower of Indian Vanity Case. Also go to the My Hair My Colour Application. Come back here & share with me which shade was recommended for you. Contest closes on 22nd October '12 at 11:00 PM IST. WINNER will be picked via Random.org & will be announced on Indian Vanity Case Facebook Page shortly after the closing date. 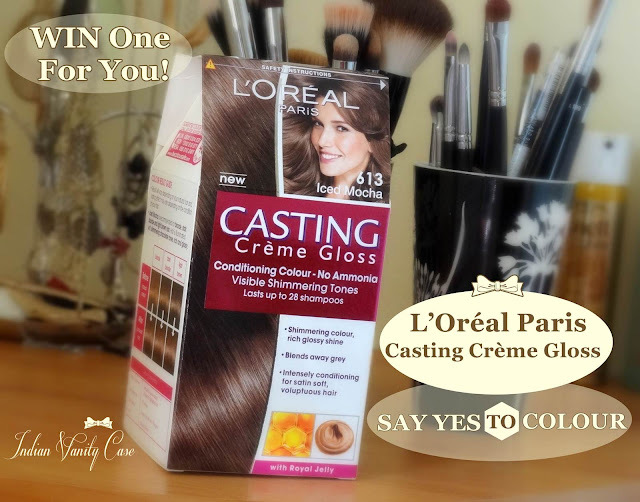 Your Casting Crème Gloss will be mailed to you by L’Oréal Paris India. Hey dear...Ebay accepts Indian Debits Cards only u have to use to though Paypal. Its much safer that way coz the money is refunded back to you in case u dont receive the item. Didn't know that, thank you so much!!! I had highlighted my hair in steaks of golden brown back in college days. Now years after I have this craving to experiment yet again. And this post has the APT timing I must say CZ. the last time i colored my hair it was cherry red by garnier....so would definetly love to try out a new look...n cz i love your blog !!! I've got rebonded hair but never colored them, would definately want to try it & it can't be better if experts like u are giving advice... ! 3) Three shades recommended for me are: Dark brown, Black cherry and Chocolate. I did the test for my mom :) Hope to win it for her . I have been on a hair color changing craze for months now. I even asked CZ how to buy the liese hair color but Ebay doesnt accept Indian Debit Cards. I have finally decided on Casting Creme Praline as I want to lighten my hair (to a warm brown) at least 2-3 shades. This comes at a PERFECT time, its like kismet.. if only I get to win!!! Sorry to delete my first post, I couldn't figure out my GFC name.. wanted a valid entry.